Josh Bertrand achieved his first Bassmaster Elite Series win in his 6th year on the circuit. 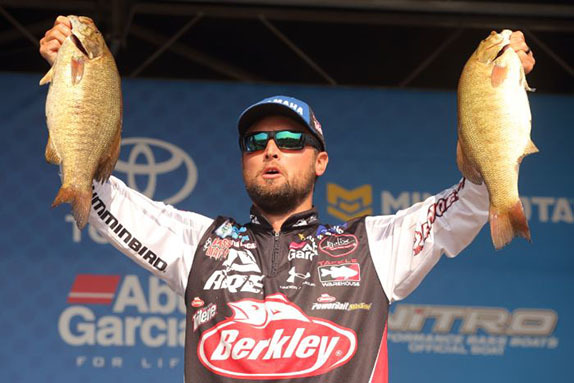 While discussing his Angler of the Year chances earlier this summer, Josh Bertrand expressed his feeling that winning a Bassmaster Elite Series event should almost be a prerequisite to capturing the points crown. He had yet to wrap his arms around a big blue trophy at that point. 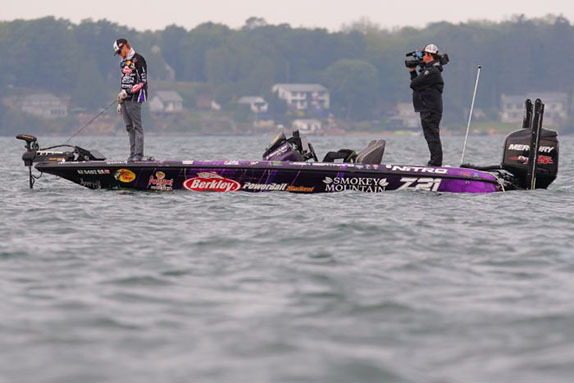 He checked off that box on Sunday in Waddington, N.Y. at the regular-season finale, edging out good buddy Justin Lucas for the victory at the St. Lawrence River. 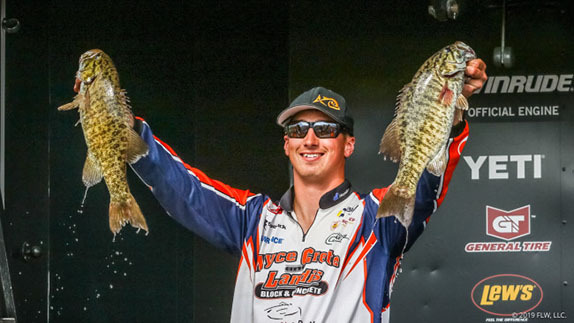 Those two will go to Georgia's Lake Chatuge next month with considerable separation between them and the other 48 qualifiers for the AOY Championship event, and it's a certainty that one or the other will emerge with the circuit's most sought-after title. Bertrand's 23-01 final-day bag gave the 6th-year pro from Arizona a 4-day total of 95-03. Lucas, a two-time Elite winner who'd taken over the lead just minutes earlier with a 24-03 sack for a 94-06 aggregate, appeared legitimately thrilled when his former travel partner surpassed him, jumping out of the "hot seat" at the side of the stage and raising both arms while smiling from ear to ear, then giving Bertrand a big hug. "That made me feel so good," Bertrand said. "He's definitely one of my best friends and it was super-cool that I got to do that with him. He wanted to win badly himself, but he knew that it would be crushing for me to lose, so he was really happy for me." Said Lucas: "It was genuine. I didn't weigh any of my fish today and I didn't really know what I had (before his bag went on the scale), but I had the same amount of excitement seeing Josh win the tournament that I had when I took the lead. "It's always really cool to see one of the good guys win his first event. I'm glad it was me who came in 2nd when it happened for him." Brandon Lester, the day-2 leader, ended up 3rd with 94-01 after tying Lucas for the day-best stringer. Day-3 leader David Walker was next with 92-11 (20-06 on the final day) and Mike McClelland completed the top 5 with 90-01 (23-04). 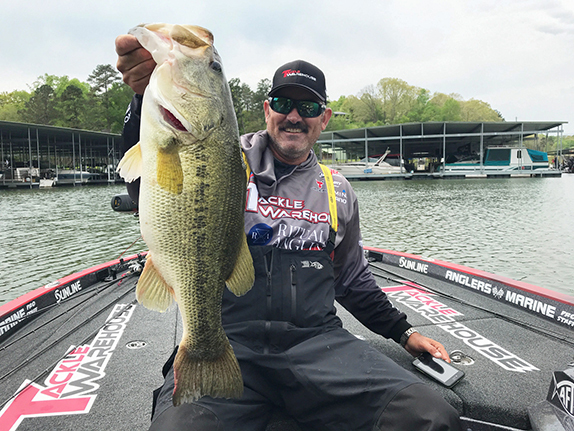 Lester was the first angler out of the Chatuge cutoff, finishing 6 points behind 50th-place Dustin Connell in the final regular-season standings. McClelland lost a tie-breaker with Marty Robinson for 52nd, but all three could make it into the expanded Classic Bracket event in late October. The 16-competitor field for that event won't be determined until after the AOY and Bassmaster Open championships. Like most of the field, Bertrand spent a lot of time at the St. Lawrence River focused on his electronics. 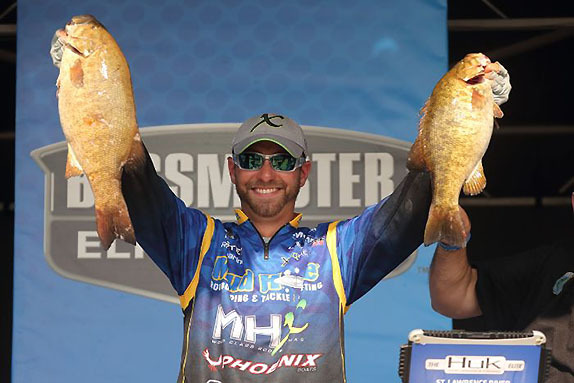 Bertrand's winning weight is the highest all-smallmouth total ever posted on the Elite Series since the circuit's inception in 2006. It surpassed the 93-06 weighed by Kota Kiriyama at Lake Erie a decade ago. Bertrand said the hour that elapsed between the time he arrived back at the dock in Waddington, N.Y. and when his bag went on the scale was phenomenally stressful. "I just knew it was going to be so tight," he said. "I knew Justin had a giant bag. Oh, man! "I had no idea what winning would actually feel like, but it's definitely surreal. I'm just so relieved � it's like getting a monkey off my back." He caught a 5-pounder early in the day and then had a flurry starting at about 9 o'clock during which he caught several 3 1/2- to 4-pounders to complete his initial limit. "That relaxed me a little bit because I knew I was one or two good bites away. At noon I caught my biggest fish of the day (a 5-12). Things had gotten tough � it was really windy and it was harder to make a good presentation, and catching that fish was a big boost. I don't think I culled after that." Justin Lucas was thrilled to see his good friend Bertrand win. He started the day fishing the prototype Berkley PowerBait Max Scent Flat Worm that had carried him through the majority of the event, but switched to a 3-inch Berkley Gulp! Minnow and compiled most of his final-day bag with the latter bait. Details of his winning pattern, as well as those of the other top 5 finishers, will be published this week. Lucas wasn't regretful about the way the tournament transpired for him. "I felt like I did everything I could this week," he said. "Now I have a chance to hold off Josh for the AOY � if I'd finished 25th, it would've been a longshot. Now I've got a great chance and I'm looking forward to getting to Chatuge." A 5-07 specimen highlighted his day-4 bag and he didn't lose any fish that would've aided his cause. "I thought I had a little more weight than that, but I might've big-eyed them a little bit. I thought I was closer to 25." His major issue was six dead fish � including five over the first 2 days � that cost him a pound and a half (4 ounces apiece). He was unaware of how to properly fizz the bladder of deep-caught bass until getting a tutorial from a B.A.S.S. conservation official after day 2. "I thought the fin clips would be enough, but they didn't seem to be effective on fish coming from that deep (35 to 45 feet). All 20 of his weigh-in fish were enticed by a Berkley PowerBait Max Scent Flat Worm. Lester's hefty bag would've been even heavier � and he likely would've won � had he not lost a 6-pounder at the side of his boat during the noon hour. "That was the only good one I lost in the whole tournament," he said. "I knew from the start that she wasn't hooked good � it was right in the tip of the lip in that loose skin. There's just no possible way you're going to land 100 percent of the fish that you hook under these conditions." He shook off the episode and upgraded with a 4-pounder just a few minutes later, but that proved to be his final cull of the day. "I tried my best to put it behind me. I knew they were biting in that spot and there had to be another one there. It was all I could do." 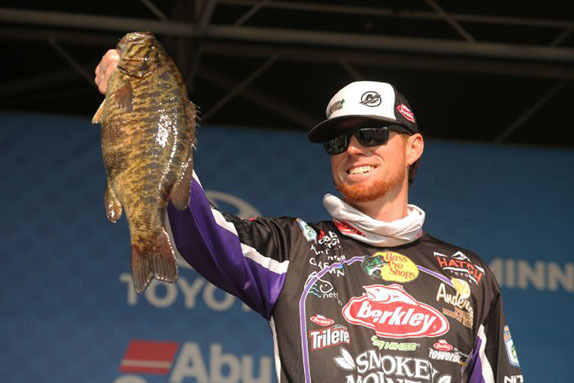 Brandon Lester caught some nice fish, but he lost a big one that could've given him the win. A 6 1/2-pounder was the first fish he put in his box on the final day. "I caught a 5 1/2 after that and then it got a little slower for awhile. I caught a 4 1/2 and 10:30 and then I hit that little flurry. The place where I lost the big one was in the same general area I'd been fishing, but it was a spot I hadn't fished. Those fish were fresh. His primary bait was an X-Zone Lures Slammer on a dropshot rig. Walker's finish provided a nice ending to a frustrating year � he ended up at No. 75 on the points list. 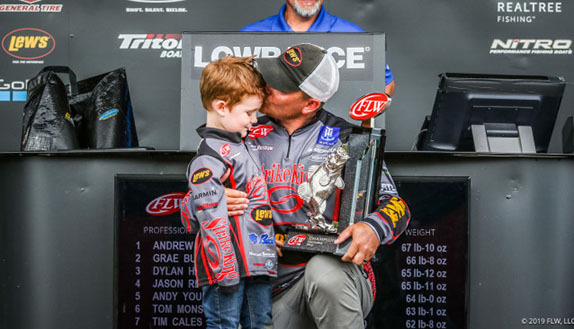 "It's been a whole season full of mishaps and I was so looking forward to just coming here and catching a lot of fish," he said. "I accomplished that � I caught the heck out of them. "This was much-needed because I was sick of not catching fish. My hands are so beat up from handling fish � hundreds of them � and that's the way it should be." His first fish of the final day was a 6-pounder, but he never came close to matching it. "I didn't fill the limit with 4-pounders today � I didn't lose them, they just didn't bite. I can't look back and be mad at anything because other people just caught more (weight) than I did. I can walk away knowing I did what I was supposed to do. I'm good with it." He dropshotted a Z-Man Trick Shot. McClelland's finish was easily his best of 2018 � his previous high was a 28th at Lake Travis. He employed a variety of baits on dropshot rigs, including a Big Bite Baits Limit Maker and a prototype offering from that company.